Tamworth Bluegrass proudly present, Ron Block & Sierra Hull In concert. This is a gig not to miss. Just a few tickets left. When: Friday 29th July 2016. Coming up next for the DCB’s is the annual Tamworth Bluegrass festival which will take place from the 9th to the 13th of June. The festival has a great lineup this year, get over to the festival, have a great time, make some new friends and support Bluegrass music in the UK!!! 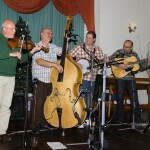 Next up for the Down Counties is the Battlefield Bluegrass Festival which will be held in Naseby on the weekend of the 14th and 15th of May. We are very excited to be asked to perform at this brand new festival!! We look forward to seeing you all there!! Still not too late to get tickets for this event, just follow the link below. Wednesday evening is usually our rehearsal night. However this coming Wednesday we are all going over to Tamworth to see the amazing Cedar Hill who have traveled from the USA to entertain us. Please visit www.tamworthbluegrass.org to purchase your tickets. Cedar Hill are as good as it gets when it comes to authentic Bluegrass music. Author DCB'sPosted on May 10, 2016 May 10, 2016 Categories Bluegrass EventsLeave a comment on Cedar Hill at Tamworth. What a great weekend at the 10th Orwell Bluegrass festival. Great Music, good company and fabulous weather! This year we have a new UK Festival “Battlefield Bluegrass” at Naseby. We will be paying a visit to the “Live Acoustic Special” on Tuesday 1st March. Always a good night, & all proceeds to Oxfam. Author DCB'sPosted on February 1, 2016 February 6, 2016 Categories GiG's1 Comment on Acoustic Special, Loughborough.